LinkedIn For Business FREE WEBINAR– Get on the list to receive notification of the next free webinar! Isn’t It Time You Get RESULTS? You probably already know this, but I’m going to come right out and say it… There is a lot of information out there about how to REALLY use LinkedIn to market your brand, get more leads and increase your sales and yet people come to me every day with confusion and no successful lead generation results for their time and efforts. I’m on a mission to help as many people as I can to learn how to build stronger personal and professional brands, attract influential connections and create more profitable opportunities! 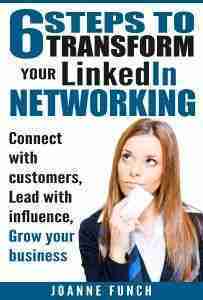 So, if you want to grow your business, build new contacts on LinkedIn and hire great people, you need to be on this platform where more than 440 million people come to network and forge mutually profitable connections. Period. If you know your ideal connectiond are on LinkedIn and you’re serious about using LinkedIn to meet your business objectives, WHAT’S HOLDING YOU BACK FROM ACHIEVING THOSE GOALS? Click Here to be notified of FREE webinar trainings! That’s why I’ve put together these practical presentations to walk you through exactly how you can do every single one of these critical tasks and master using LinkedIn for business. I look forward to having you on the training!